Walmart got a beautiful product range of Christmas trees, decoration and accessories. Walmart Ads Christmas special savings will be your main option to shop and while shopping save a lot for this Christmas. Cyber Week deals is another featured of this catalog full of advice that will lead you to best places for shopping. Instead of surfing internet for hours you can use this very helpful Walmart Weekly Ads. Select the best tree from this range at which you can reach 4 varieties of them. Special range of the Christmas decoration is also featured by the same part of the ads. Coolest looking Christmas tree of all. One of the best accessory for Christmas. Amazing offers of kitchen appliances, electronic devices to get your life easier are available this week with the lowest prices. In this month you can save your budget at most because all deals come up in the last of the year. This is always like that. A perfect device with powerful system to blend all kinds of food in your kitchen. Fantastic gadget to cook wonderful meals in Christmas holiday. If you are sick of dirts in your living room and hall you can use this device to get rid of them completely and forever. A beautiful device of powerful speaker and it also has CD receiver. Walmart Cyber Week is about electronic gifts consisting of game consoles like Playstation 4, and video games, kitchen electronics, some home appliances and so on. You can catch the best deals with following ads of the cyber week and this is kind of Black Friday entitled as cyber week because some other discount stores are also making new deals with these electronic products. For further information of products like notebooks, iPad, or various gift offers like vacuum cleaners you can reach the best product range by Walmart Black Friday and Cyber Week ads. "Toys and video games" is very interesting part of this sale to talk about. We were on different kinds of toys that are produced by brands like Lego, Fisher Price, VTech. On one hand it depends on what you are looking for from a toy catalogue. But in most cases people care about what these toys can give children. In order to be aware of this situation you have to take a closer look on the toy sale products of such stores like Walmart. You will reach one of the best ones of kids' room decoration as well. Walmart has created a perfect lookbook for customers who were looking into seeing the new Black Friday deals. Walmart Black Friday Ads feature the best prices of the whole year for the most popular electronic products, entertainment products, cameras, smart phones, smart TVs, game consoles and video games, DVD movies, and toys. Generally these are the aisles featured by the Black Friday range. You can find it on the weekly ads pages if you click on the image of the first page of the whole sale. Firstly it makes sense to take browse a little on the toys. Because their selection of brands is impressive especially considering the prices. Little Tikes, Thomas and Friends, Disney, Nerf, Razor, and clothing products with prints of famous cartoon characters are among the products on sale. Besides Christmas gifts and gift packs, gift boxes are possible to be available in this catalog with special prices. * DIAMOND HOOP EARRINGS, GIFT, $20 pg; 18. * AVIA ATHLETIC SHOES, $9.75 pg; 17. Barbie toys consisting of dolls mostly are available on pg; 9. Other toy pages offer combination of brands and styles of toys. Various brands have been included. Xbox One and Playstation 4 are naturally appearing in front of me when I turn the first page. I was expecting such price range and product range considering the popularity of these video games run by these two great consoles. Additionally they retail additional accessories like dual shock controllers and awesome headphones with maximum sound quality to enjoy your game at top level. * Headset for Xbox One. See video games from pg; 4-6 for these two game consoles. Same game with version of Playstation 4® at same price. Electronic helpers are available within the sale of Black Friday deals at Walmart stores. They are best of the electrical home appliances and they make everything easier when you cook and prepare something in your kitchen. Deals at TVs can be seen on pg; 29. LED display is now the most popular ones. And we can't think of new products regardless of Samsung's Smart TV collection. It is now ready for your consideration before Christmas and Thanksgiving. Just take a look at the pg; 29. Find notebooks of average performances for your daily simple works on pg; 31. There is a considerably low price range. 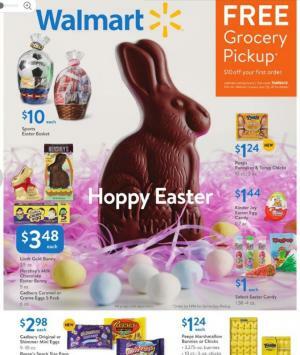 Walmart's weekly ads that has been announced for the 3rd week of November is mainly focused on Walmart Christmas Top Toys that comprises many different types of toys like education, entertaining, electronic and so on. Top toys range is a product list of Walmart Top Toys which consists of many of very popular toy brands. 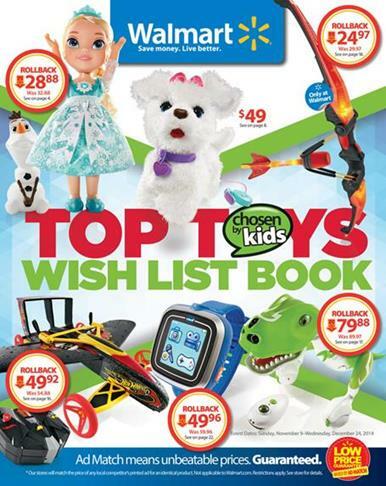 This weekly ads have many toys for boys and girls. It is valid Nov 9 2014 to Dec 24 2014. A perfect list of deals on video games and game consoles are available at pg; 29. The most popular video games are Fifa 15, Madden NFL 15, NBA 2K 15 at very good prices. If you take a look at these pages you will discover a really helpful range of christmas gifts as well because your friends will love the PlayStation® 4 that you will present them. The price for PlayStation® 4 is just $399 and Xbox One™ Console $349 at Walmart stores and online shopping stores. Black friday is coming!! This article is about Walmart black friday 2014 deals. The prices are unbelievable. 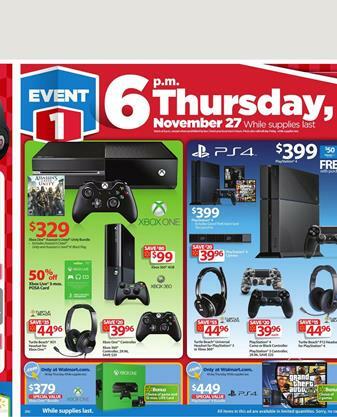 Walmart black friday 2014 deals event is starting at 6 p.m November 27 Thursday online. The prices will be valid until supplies last. This is great shopping event after thanksgiving. Let's take a look at Walmart offers now. These are top electronic offers. 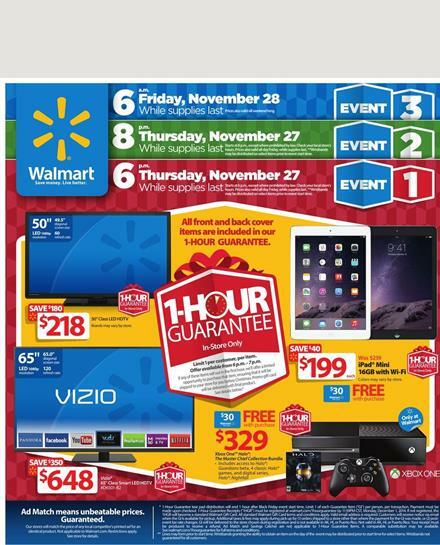 Please check out Walmart black friday ad for more electronic offers. If you are a video game fan you are lucky! Most of the video games are $35 at Walmart on black friday. Of course that's not it. You will find high quality and fashionable mens womens and children's clothing at Walmarts. Please explore the ad for more offers. 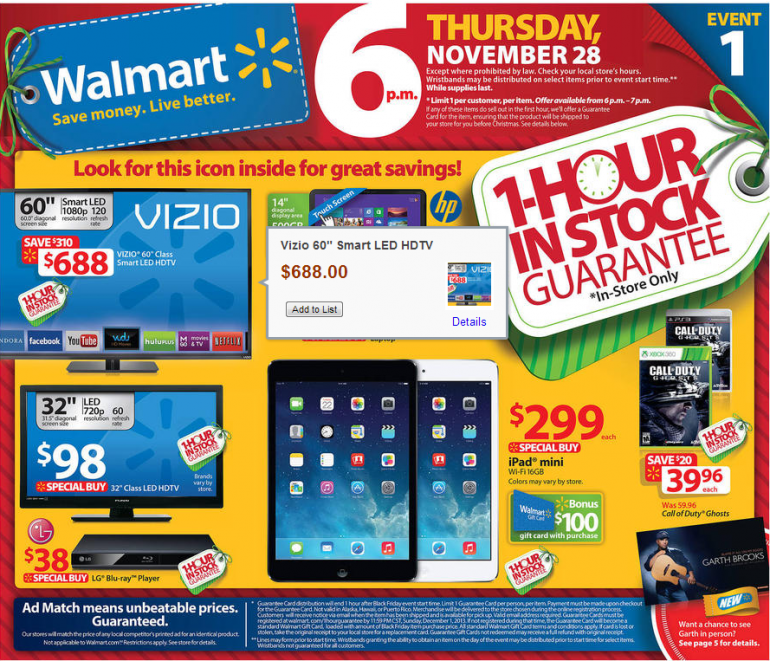 Don't miss Walmart black friday 2014 deals!